Webers are often maligned. This is more often due to poor installation by inexperienced and impatient mechanics. Webers are not rocket science, nor do they require that one be an experienced mechanic. What is required is a good deal of common sense, a methodical and patient approach, and some understanding of the air-fuel system and its combustion. For every owner I have spoken with who have expressed their nightmare with Webers, there are 2-3 owners who have glowing remarks. The only real complaint that can be leveled at Webers is their consumption of fuel (which may be symptomatic of incorrect jetting/valving). Expect 15-18mpg in a TR6 that is driven at a more-than pedestrian pace. Read TerriAnn Wakeman's page on DCOEs for TR2/3. Terri's article is highly recommended. 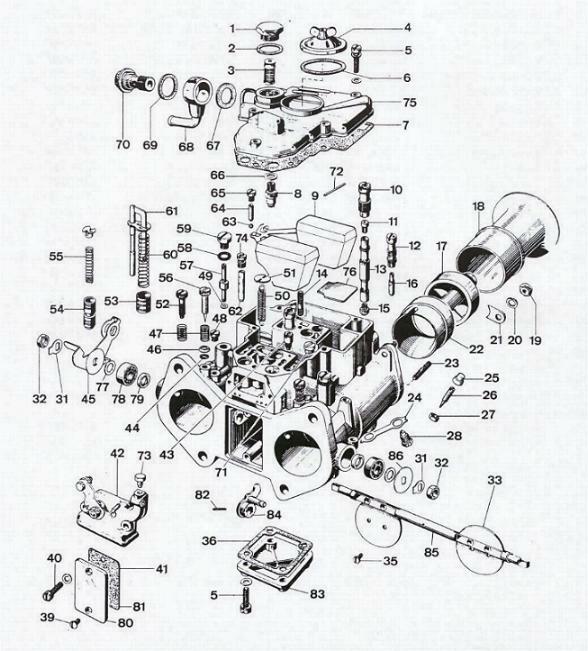 Task: To provide an electronic archive of accumulated knowledge of fitting a set of Weber 40 DCOE Webers to Triumph TR250/TR6. Sources include books, email, interviews and web-sites. Note: All DCOE carbs are not equal. They will often differ in the length of the accelerator pump stroke and pattern of progression holes. The designator is stamped on the casting. Weber recommend the 40 DCOE-18 for Triumph 3/4/250/TR6/GT6, whereas Haynes Techbook suggests that the 40 DCOE-2 is best for TR250/6/GT6 and 42 DCOE-8 for TR2-4. I attempt to explain the reason for this discrepancy in the article below. This little fact is almost completely ignored by most so-called Weber experts. Get this wrong, and you may always have a flat-spot. Note: The TR6 heads for 1969-73 differ from 1974-75 in intake port size and location. Before you purchase a set of Webers, make sure the intake manifold will match your heads. K = accelerator pump inlet valve with exhaust orifice (also called a discharge bleed). Weber (0)       30  4.5  120  F11  160  50/F11  40  50  ? (0) See reference list at end of page. (4) "... and most important- choke tubes (venturis)- 28mm Disconnect the choke cable- it isn't needed. Make sure that the float level is correct. Also I run 26 degrees total advance on the distributor (10 + 16)." (Larry Bickel, ljbtvr at aol dot com, Apr, 97). (5) "The cam specs: Intake-Open/Close-36' BTDC/ 69' ABDC Exhaust-72' BBDC/33' ATDC Lift 405 Dur 285..... The multiple spark feature of the MSD 6AL Ignition module made a BIG difference for the fuel richness/plug fouling, .055 spark plug gap for NGK BPR6ES, using standard points/gap and a Lucas Sport coil. Timing is about 28' advanced.......Roller rockers are 1.50:1. Stock exhaust headers and freeflow, dual mufflers. Compression-9.5:1. We tried the 45F9 and 60F8 idle jets but didn't work. Also tried 180 air, F16 emulsion and 125 main jets. Initially had 40 accel pump jets. Again no luck." (Bob Mains, President, Buckeye Triumphs, bob dot mains at ode dot state dot oh dot us, Sept 00) . (8) Mild street car. DCOE-18 on car for 17 years, one owner, who was pleased with the way they ran. No other details available (author, Apr 98). (9) The current model 40 DCOE is the 151 series (made in Spain), and I give its calibration as a means of reference. The 151 series seems to be appearing in "TR6 kits" offered by the big parts vendors and found on the web. Additional calibration material are: progression holes=120/100/100, throttle-plate angle=78 degrees. I'm not sure how well this unit would work "out of the box"; probably not! Clearly space precludes and exhaustive treatise. But to summarize, the only thing that a tuner is testing is the mixture strength. One can do this by the "plug cut" method (checking color of the spark plug electrode), or analysing exhaust-gas. Use of an O2 sensor plugged into the exhaust system will certainly help the tuner (K&N make a good system), the best technique has always been the plug cut, conducted either on a dyno, or correctly on the road. Generally quite simple once a suitable time and place are chosen. Ensure that the correct plugs are being used, and are clean (i.e. new, or near new), with a white insulator. Then, simultaneously, foot off the gas, disengage clutch, ignition off. Inspect the plug(s), usually one plug for each of the carburettors. If the plugs are sooty black, then the mixture is too rich. If the color is that of milk chocolate, it is a little to lean. If the color of dark chocolate, then a little too rich. A good reading will have the insulator showing almost white, with just a suspicion of grey, and a plug body on the dark side, just enough to mark a piece of white paper with soot. Further interpretation of plug color can be found elsewhere on the web, but the color to avoid is an even battleship grey on the whole plug, electrode, insulator and body - a sure sign of detonation or pre-ignition (ignition too advanced). This may be the domain of the accelerator pump. As noted above, the 40 DCOE comes in different series, each with a variety of accelerator pump stroke lengths. The series 2, 4, 24, 27, 28, 32, 33 have 14mm stroke lengths, the 18, 22/23, 29/30 have 10mm stroke lengths, the 31, 34/35, 44/45, 76/77 have 16mm stroke lengths, and 72/73, 80/81 have 18mm stroke lengths. The pump stroke rod (which governs stroke length) is interchangeable between series, but must be chosen carefully when combining with the various combinations of accelerator pump jet and pump bleed valve. Most owners have suggested using a blank bleed, which is consistent with the Hatnes recommendations, but this is inconsistent with the Weber recommendation. We are thus we are playing a game of balancing three variables; pump stroke, jest size and bleed size (4 variables if you wish to include pump spring rate), all of which regulate the volume and duration of gas delivery between throttle application and when the main jet can catch up. And of course, we would like the accelerator pump system to discharge no gas when the throttle is kept constant or opened slowly. Ultimately, the solution to these variables will depend on engine modifications, style of driving, and rpm. In general, the short-stroke pumps are well-suited to engines having siamesed inlet ports or one carb feeding multiple cylinders. This could then explain the Haynes recommendation of using the 40 DCOE-2 series with its 14mm long stroke. However it seems that to compensate for the long discharge duration, Haynes recommend that the bleed be closed. Blanking off the pump discharge bleed ensures a rapid response, but this also means that the total gas quantity pumped by the piston differs little whether the accelerator pedal is moved slowly or rapidly, meaning that the mixture will be overly rich on gentle acceleration. Thus, among other things, a closed bleed will greatly increase gas consumption. IMHO, the dedicated owner could well improve any flat spots by experimenting with open discharge bleeds. This may well be Weber's thinking when they suggest the 10mm stroke pumps with 50 bleed. Haynes were probably thinking of the Federalized TR6 motor with its 104hp. I suspect that Weber's recommendation is for Euro-spec motors, likely the original 150hp PI, or modified TR250/6. It seems that many Weber owners blame mid-range fade on the progression circuit. The different DCOE series do place the progression holes in in different places, but I have not confirmed if they differ between the DCOE-2 and DCOE-18 series. I need to do more research on the subject, but I can definitely state that the sizes of venturis, nozzles and emulsion tubes are not relevant to progression. This is an area often ignored by owners. Weber advises that the distance from the mouth of the carburator to the nearest obstruction must be at least equal to the bore diameter of the carburetor intake. This means the bore of the air horn , not the diameter of the entry flare. Many triple-Weber kits are supplied with 35mm high horns which may look impressive, but most TR6 owners remove them because they are too long for the 1.75" air cleaners that must be used in order to clear the inner fender arch. This is a BIG mistake. Never run your DCOEs without air horns that insert into the bore. Do not use air horns that simply bolt-on and are readily available and cheaper. An important function of the air horn is to hold the auxiliary venturi in place. Without the air horn, the aux. venturi will not fall out, but it will rattle around in the breeze. Low profile (12 or 13mm) air horns are available which will allow you to use air cleaners. This is probably one reason why TR6 owners become frustrated with their DCOEs. However, there is a down side to running short air horns, relating to smoothness of torque delivery and the amplitude of the pressure-wave or "standoff" which appears as a spray of fuel mist during over-run. Remember, the one choke per cylinder of the DCOE acts like an organ pipe, so the length of the tube from the center of the intake valve to the entry flare of the air horn. Passini suggests that this length be about 4 times as long as the piston stroke. I've not made the mesurements, but I'm sure that S&H, Cannon and TWM who cast the intake manifolds were aware of this and chose the 35mm air horns as providing the optimum length for the TR6. I'll confirm this in due course. So, if you have the space, use the 35mm high horns with 3.5" K&Ns. If not, run with the 12mm horns and the 1.75" K&Ns. Air filter socks: If you are running horns and wish to run an air sock, ITG make socks for TR6s running DCOEs on TWM manifolds. Use a ITG JC100 series filter with a 36-JC-100 backplate (presumably for 36 DCOE). This snippet from TerriAnne Wakeman gleaned from an old TWM catalog. Webers are very sensitive to variations in fuel pressure and quality. Install the biggest and best fuel filter you can buy (the FRAM HP-1 is recommended). If your Webers seem to lose their edge with time, it is probably because of dirt in the jets. Remove each jet and blow it clean. Only 10 minutes work, but you will be rewarded with pristine performance again. The standard Triumph fuel pump is totally inadequate. Webers need lots of fuel flow but can't stand pressures over about 5psi (3-4psi is a good number). 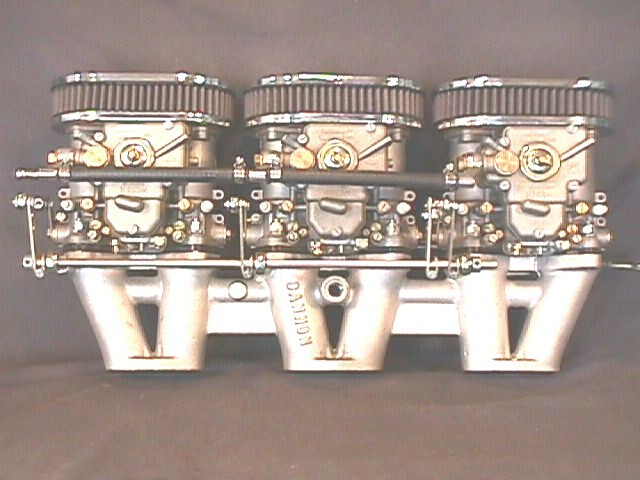 The shiny-toy pressure regulators sold in discount stores cannot flow enough fuel to keep three big float bowls full at high engine speed, unless you use one per carb. An unregulated stock fuel pump will put out up to 8psi at hi-rpm which will sink the floats, causing other problems. Discussions with people who have successfully implemented multi-Weber installations, it seems that the key issue to resolving the Weber's lack of popularity amongst amateur tuners is the cam. Matching the cam to the Webers appears to be of prime importance, because then nominal jetting can be used. Also see my article on performance cams. What constitutes a good cam? It appears that Webers prefer cams with long duration. This makes sense because there is little vacume provided in the DCOE/IDA design, and the long duration is needed as a compromise. Last update: 7 September 2006.